Director – Christopher Douglas-Olen Ray, Screenplay – Naomi Selfman, Story – Micho Rutare, Producer – David Michael Latt, Photography – Alexander Yellen, Music – Chris Ridenhour, Visual Effects – The Global Asylum (Supervisor – Mark Kochinski), Makeup – Adina Sullivan, Production Design – Aaron J. Martin. Production Company – The Asylum. 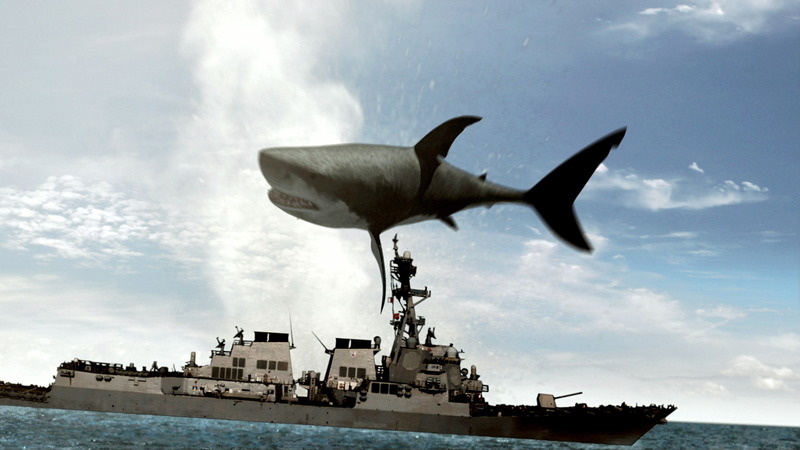 Aboard the Navy ship USS Gibson, shark specialist Dr Terry McCormick is certain there is another giant prehistoric megalodon shark out there. This is dismissed by his superior Admiral Calvin until a megalodon erupts out of the ocean and leaps across the ship. Meanwhile, Nigel Putnam, a British hunter of exotic creatures, is hired by an international mining company in the Republic of Congo after a prehistoric giant crocosaurus is unearthed and goes on a rampage. Putnam and his team succeed in capturing the crocosaurus and set out to transport it to captivity, only for it to get free. As they hunt it, they come up against the Navy hunting the megalodon where the two giant creatures amok cause some confusion. Putnam and McCormick combine forces as the two creatures cause mass devastation through shipping and urban areas, proving near-unkillable in their efforts to stop them. Mega Shark vs Giant Octopus (2009) was one of the defining and influential hits for The Asylum. Without it there would be no Sharknado (2013) or any of the other deluge of gonzo killer shark films – see the likes of Sharktopus (2010), Sand Sharks (2011), Snow Shark: Ancient Snow Beast (2011), Swamp Shark (2011), Bait (2012), Jersey Shore Shark Attack (2012), Jurassic Shark (2012), 2-Headed Shark Attack (2012), Avalanche Sharks (2013), 90210 Shark Attack (2014), Raiders of the Lost Shark (2015), Roboshark (2015), Shark Exorcist (2015), Zombie Shark (2015), Atomic Shark (2016), Ice Sharks (2016), Ozark Sharks (2016), Planet of the Sharks (2016), Sharkansas Women’s Prison Massacre (2016) and Trailer Park Shark (2017), among others. Not to mention the horde of copycat Mega ____ films like Mega Piranha (2010) and Mega Python vs. Gatoroid (2011). Mega Shark vs Giant Octopus has also produced several sequels, beginning with Mega Shark vs. Crocosaurus here and followed by Mega Shark vs Mecha Shark (2014) and Mega Shark vs. Kolossus (2015). Mega Shark vs. Crocosaurus is probably a better film than Mega Shark vs Giant Octopus (although this is relatively speaking as the lowered expectations of Asylum films go). One of the faults of Mega Shark vs Giant Octopus was its cheapness and reliance on the absolute minimal number of CGI effects shots necessary. That is remedied here and the film is far more liberal with its application of effects, even if they still only end up seeming cheap. The Crocosaurus, when it appears, is equally ridiculous. Supposedly a prehistoric crocodile (something that did actually exist), all we get is a giant standard crocodile but about the size of a Jumbo Jet and coloured yellow-green. The battle between the two of them comes down around the level of the average 1970s Godzilla vs ____ film, although the major difference is that the Godzilla films compensated with cheaply entertaining mass destruction effects whereas the effects here only radiate a sense of utter impoverishment. Many Asylum films feature down-on-their-luck former tv actors who are happy to work for as little as possible. The first Mega Shark film featured the novelty of 1980s pop singer Debbie Gibson playing a marine biologist. The amusing piece of stunt casting here is the casting of Jaleel White, better known for the role of uber-annoying nerd Steve Urkle in the tv sitcom Family Matters (1989-98). Minus his trademark glasses, White plays it straight and is largely unrecognisable as an adult actor. As its hero, the film boasts Gary Stretch, a former British boxer who has eked out a minor acting career, who gets the cynical, grizzled Indiana Jones-type adventurer hero down right. The largely unknown Sarah Lieving plays the part of a naval officer with a hard-headed determination where she gives the material far more than it deserves. Director Christopher Douglas-Olen Ray is the son of prolific exploitation director Fred Olen Ray. After debuting as an assistant director on his father’s films, Christopher Douglas-Olen Ray has produced a number of films for The Asylum and directed Reptisaurus (2009), Almighty Thor (2011), Shark Week (2012), 2-Headed Shark Attack (2012), Asteroid vs. Earth (2014), A House is Not a Home (2015), Mega Shark vs Kolossus (2015), 3 Headed Shark Attack (2015), Circus Kane (2017) and Minutes to Midnight (2018).